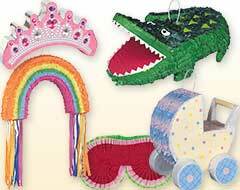 Entertain the young and adult guests attending your party by having a piñata game. We have the widest variety of pinatas available at an affordable cost so that you don’t have to compromise with the fun time. 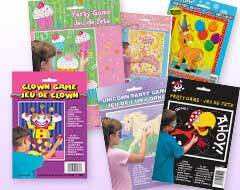 A piñata party game is sure to give them tons of fun and some delicious things to carry home as a token of appreciation. Fill our piñatas with candies, chocolate bars, crayons, sketch pens, erasers, etc., hang them at a low height so that kids can easily reach them, blindfold the players (one at a time), and ask them to hit it with a stick to break it open. The pull string ones have to be pulled instead of smashed. 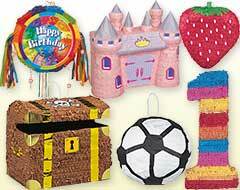 Have tons of entertainment at your party by using our kids’ birthday party pinatas.